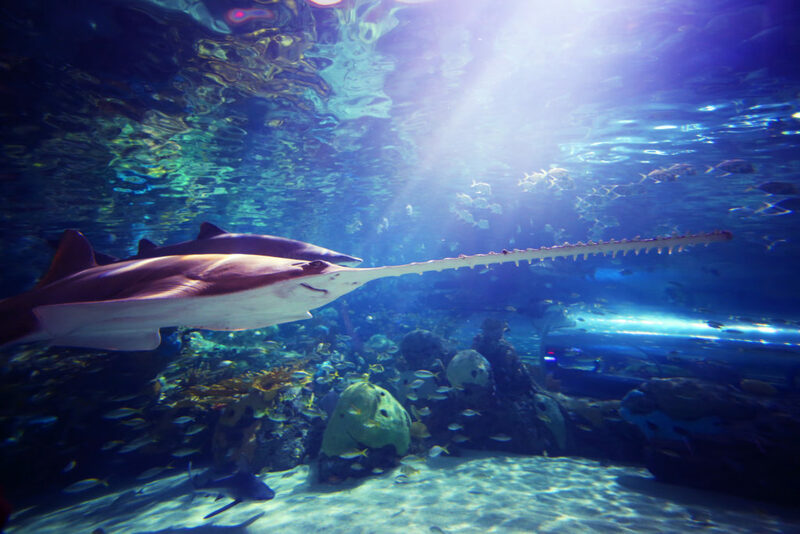 On Tuesday, October 17, Ripley’s Aquarium of Canada joined several aquariums across North Americain celebrating the first annual International Sawfish Day! Did you know? There are only five species of sawfish in the world – Dwarf, Knifetooth, Smalltooth, Largetooth and Green sawfish. The largest being the smalltooth sawfish, which can grow up to 25 feet! One of the ways that Ripley’s Aquarium of Canada celebrated these incredible species with TWO Facebook LIVE events! If you didn’t get the chance to “tuna” in on Tuesday, check them out below. First up, our Marketing Coordinator Sarah joined our Senior Aquarist Ka in the Dangerous Lagoon Tunnel to discuss all things sawfish. During their chat, they were even joined by a very special guest – our male green sawfish! The male and female green sawfish that call Ripley’s Aquarium of Canada home can often be seen lying on the tunnel, giving guests the perfect view. During the second Facebook LIVE, Sarah joined one of our Lead Educators, Danielle, behind the scenes to give viewers a look at how we feed the animals in the Dangerous Lagoon, including the two resident sawfish. Danielle answered some great questions – including the purpose of the sawfish’s rostum, how they are able to eat and even what they are fed here at the Aquarium. One important topic that both Kat and Danielle discussed was the many threats that face these animals, and how we can help. The sawfish gets their name from their long rostrum, or “saw”. Due to this unique morphology, combined with slow growth, all five species of sawfish are listed as endangered or critically endangered by the IUCN (International Union for Conservation of Nature). Their rostrum often causes entanglement in fishing nets and other marine debris and can often lead to targeted trophy hunting. They are also continuously hunted for their meat, liver oil and fins for the shark fin trade. And, as a species commonly found in shallow coastal waters, their habitat is at risk due to development. Even though we may be located thousands of miles from the nearest sawfish habitat, there are many ways that we can help. Most importantly, it starts with education and creating awareness. By participating in activities such as International Sawfish Day, we can create awareness of these animals and their importance in the ocean and threats they face. We hope that you enjoying “tuna”ing in to our Facebook LIVE events, and they you will share them with your friends so that they too can build a connection with these magnificent ocean creatures. Have a question about the Aquarium, or something you would like to see on Deep Sea Diary? Comment below for the chance for your question to be featured in our monthly Q&A post! Do sharks get cancer and if they do, how do they get cancer? ?